Parks’ 10 Tots Aromatherapy Gift Sets make ideal gifts for friends and family alike. Each set is a hand-selected assortment of 10 of our most popular aromatherapy candles in a convenient, long-burning ‘tot’ size. 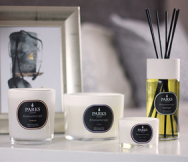 You can burn the candles individually, of course, but they are designed to be used in ‘bouquets’, combining different fragrances and essential oils to evoke a specific aromatherapy effect – as well as a complex and pleasing aroma. The 10 Tot Aromatherapy Gift Set Number 2 arrives in a presentation-quality gift box.